A new method to sensitively measure the structure of molecules has been demonstrated by twisting laser light and aiming it at miniscule gold gratings to separate out wavelengths. [dropcap style=”font-size: 60px; color: #9b9b9b;”]T[/dropcap]he technique could potentially be used to probe the structure and purity of molecules in pharmaceuticals, agrochemicals, foods and other important products more easily and cheaply than existing methods. Developed by physicists at the University of Bath, working with colleagues at the University of Cambridge and University College London, the technique relies on the curious fact that many biological and pharmaceutical molecules can be either ‘left-handed’ or ‘right-handed’. Although such molecules are built from exactly the same elements they can be arranged in mirror images of each other, and this configuration sometimes changes their properties drastically. 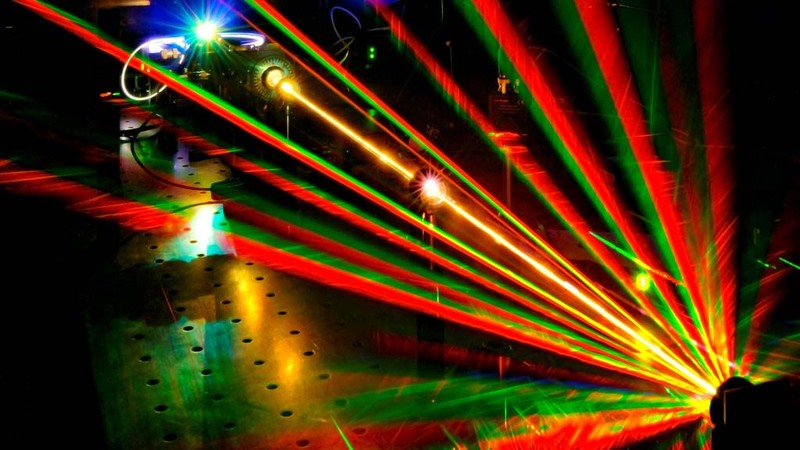 The research team from the Centre for Photonics and Photonic Materials, and the Centre for Nanoscience and Nanotechnology at the University of Bath, used a special white-light laser built in-house and directed it through several optical components to put a twist on the beam. The twisted laser beam then hits a nano-scopic U-shaped gold grating which serves as a template for the light, further twisting the beam in either a right or left-handed direction. This deflects the beam in many directions and further splits it into its constituent wavelengths across the colour spectrum. By carefully measuring the deflected light scientists can detect tiny differences in intensity across the spectrum which inform them about the chirality of the grating the laser beam interacts with. The study, published in the journal Advanced Optical Materials, demonstrates the technique as a proof of principle. Christian Kuppe, the PhD student who conducted the experiments, said: “At the moment chiral sensing requires high molecular concentrations because you’re looking for tiny differences in how the light interacts with the target molecule. “By using our gold gratings we aim to use a much smaller amount of molecules to conduct a very sensitive test of their handedness. The next step will be to continue to test the technique with a range of well-known chiral molecules. Industry 4.0 Readiness: Do You have the Power?